The world’s most expensive soup? 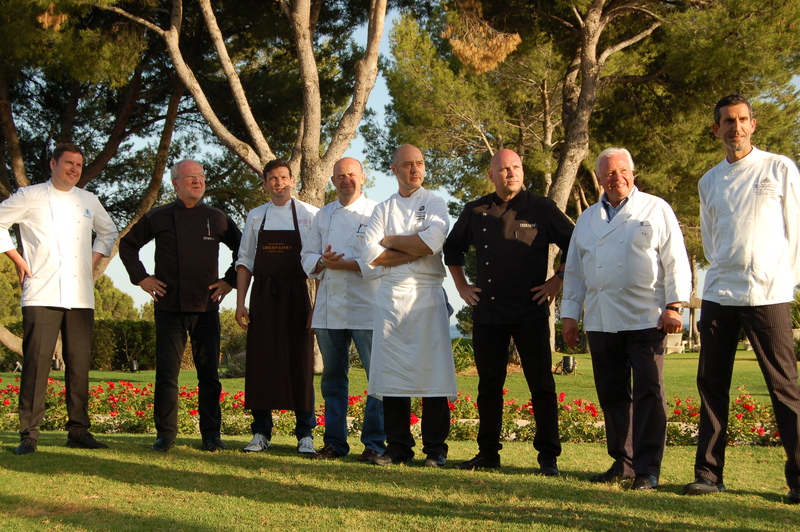 For two people who don’t have a bulging bank account, we’ve done rather well recently as far as eating Michelin-starred cuisine goes: The Boss and I were invited to the 3rd Safari Culinario at the St Regis Mardavall Mallorca Resort. The latter was foodie heaven: of the eight talented chefs (six of whom had flown in from Germany) who prepared the evening’s spectacular dishes, five are recognized for their Michelin-starred food. It was an amazing event that should be on the bucket list of any serious gourmet. Eight chefs, one exceptional dinner, no power cut. But none of these culinary superstars offered what could have been the world’s most expensive soup. I’d already made that, back in the spring . . .
Every May my father and his brother (my Uncle Ray) come to stay at our finca for the first of the two holidays a year that they have with us in rural Mallorca. But this year’s spring holiday was rather different to ones they’ve previously had: it was the coldest May here (and in other parts of Spain) since 1985. Usually, they’d spend quite a bit of time relaxing in the steamer chairs on the terrace, soaking up some vitamin D (well they do live in England, where sunshine has become a bit of a rare commodity). Ray – who tans easily – would normally remove as many clothes as he could (within the bounds of decency) to build up that enviable just-back-from-holiday golden glow. But not this year. Over the eight days they were here, only one day was warm enough to relax outdoors. Sweaters and long trousers were pressed into service, and much time was spent indoors reading, listening to music, and chatting. One day was particularly bad. A howling north wind, rain lashing down the windows and a top temperature of 13 degrees Celsius (we’ve had it warmer in January!) confined us to the house. When the ever-optimistic Ray (“It looks like the sun’s trying to get through”) gave up dreaming of a tan that holiday, I knew desperate measures were called for. I would make carrot and cumin soup for lunch – soup being a wonderful comfort food. A delicious aroma was soon wafting through the house. At the appropriate moment, I poured the hot soup into our Kitchen Aid blender (recently back from Palma where it had been in for repair) and pressed the button to set the blitzing in motion. Or not. The instant I switched the thing on, the entire electricity system died. Long story short, our dependable electrician came out on an emergency visit and returned later that afternoon when he’d been able to find the required new part for the fuse box. A rather complicated and expensive part that cost more than 300 euros. Now that’s what I call an expensive lunch.